A Fibre Channel PCI Express card is required to connect a Mac Pro or Xserve (Intel-based) to external Fibre Channel storage or an Xsan network. A user installable kit contains an Apple Dual-Channel 4Gb Fibre Channel PCI Express Card (host bus adapter) plus two 2.9-meter 4Gb Active Copper Fibre Channel SFP to SFP (small form factor pluggable) interconnect cables. The Fibre Channel PCI Express card is installed in your computer, and the cables are used to connect to the SFP port on a Fibre Channel storage device or Fibre Channel switch SFP connectors. 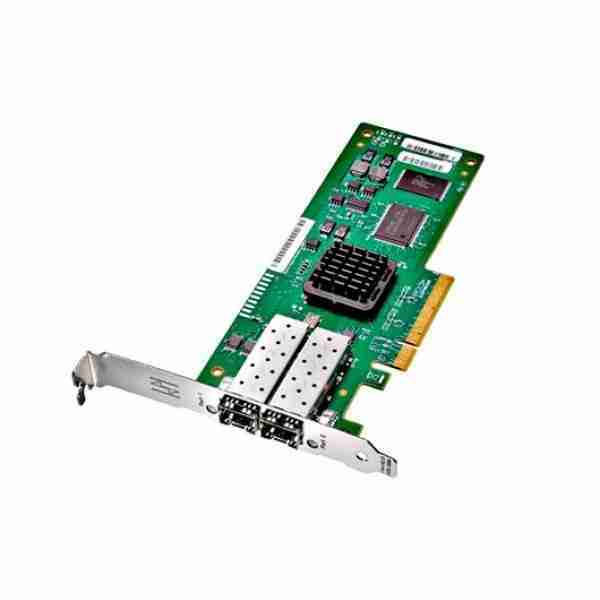 This card runs at full bandwidth in a four-lane or eight-lane PCI Express slot. SFP connectors on the card allow use of copper or optical cabling and provide the capability of directly connecting to Fibre Channel storage and switches over long distances up to 500m. The Apple Fibre Channel PCI Express card offers leading performance and compatibility with Mac OS X, Mac OS X Server, and Xsan. Software: The Apple Fibre Channel 4Gb PCI Express card requires Mac OS X or Mac OS X Server v10.4.8 or later. Only one 4 GB Fibre Channel Card is included. Installation of an Apple Fibre Channel PCI Express card in Mac Pro reclassifies these systems as FCC Class A devices. Optical connection requires SFP transceivers and optical cables. This card is not compatible with PCI or PCI-X based systems. 661-5007 Card, Fibre Channel, Quad-Channel 4GB for A1186 & A1289 Mac Pro – New!